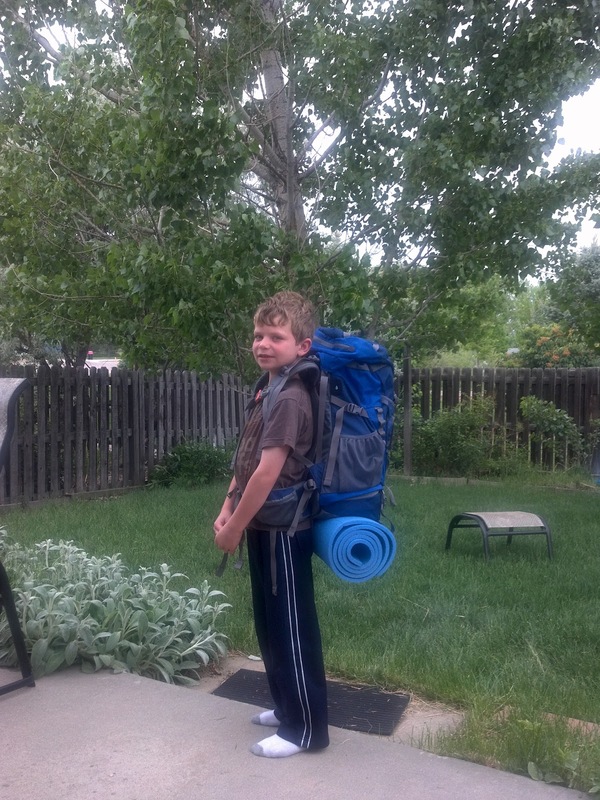 Last year while we were camping, my youngest son surprised me by saying he wished he could go back-packing. I like to think we are an outdoorsy (is that really a word? My spell check seems to think it is) family. Both our children started camping before they could walk (I even have online pictures ... follow this link for some of Connor's) and we go on more camping trips every year than most other families I know. The kids always have fun when we camp. Sometimes (quite often, actually), though, my kids complain about hiking or biking on weekends we are home. If it were up to me, we would go on a hike or bike ride or do something active outside every weekend, but too often my kids tell me they would rather stay at home and play wii. So, the fact that I have to force the kids to do something active outside made me think that getting my kids to back-pack would be an uphill battle. This is why it surprised me when Connor said he wanted to go back-packing. We never went back-packing last year, but you may remember that in August the boys and I went camping without their mom (see Just the Boys Camping) and I took them to one of my favorite back-packing spots as sort of a test-run. We took a day hike along where I thought I would probably take them on their first back-packing trip. After this test-run, the boys still thought that back-packing sounded fun ... especially my younger boy. We even got Connor a back-pack for his birthday. This weekend, Connor and I are finally back-packing together. I love back-packing and am very excited about this. If you've been following this blog for awhile, you may remember that I go on solo back-packing trips that I refer to as SheppyQuests. You can read quite a bit about the SheppyQuest at http://blog.ericshepard.com/search/label/SheppyQuest or SheppyQuest 2005, SheppyQuest 2008, or SheppyQuest 2009. My wife and I did a bunch of back-packing before we had kids, but since Tyler was born, I have not been except for those solo-trips. The fact that I can start back-packing with my family again is something that makes me extremely happy. We are actually going to the same spot as most of those SheppyQuests. The plan for his first trip is not to hike in very far along the trail before setting up camp. He is still just a child and I certainly don't want his first trip to be very tough on his little legs. Hopefully the spot I am thinking of is open this holiday weekend (by the time you are reading this, I will already know if that spot is open). Will be bringing my son here this weekend. Anyway, I am scheduling this to post while we are on the trail. Actually, by the time you are able to read this, we will probably have our tent already set up. Hopefully my boy still wants to back-pack after we get home. I'll be updating you and posting pictures sometime next week.